FREE Starbucks Coffee In January When You Buy A Made Greener Coffee Refill Tumbler! You are here: Home / Great Deals / FREE Starbucks Coffee In January When You Buy A Made Greener Coffee Refill Tumbler! Buy a Made Greener Coffee Refill Tumbler, 16 fl oz for $30 and get a FREE grande brewed coffee every day for the month of January 2015. Made in the USA and containing 35% post-consumer material, this acrylic coffee tumbler celebrates coffee origins with a coffee cherries graphic embellished with metallic gold accents. The tumbler gets you one grande brewed coffee every day for the month of January 2015. The 16-fl oz tumbler’s double wall construction helps keep hot beverages hot and cold beverages cold. Handwash only. Do not microwave. 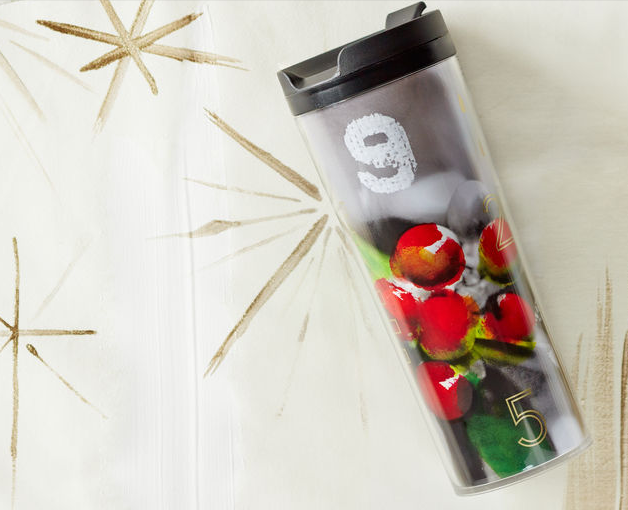 A double-walled tumbler made with recycled materials that gets you one grande brewed coffee every day for the month of January 2015. Just bring it into a participating Starbucks store and let your barista fill it with joy.